Help with self-esteem and confidence building in Manchester. Nigel is a skilled Manchester Psychotherapist, Life Coach and NLP Master Practitioner, and Clinical Hypnotherapist who has many years of experience of successfully working with self-esteem, confidence building and anxiety related issues. The treatment integrates Psychotherapy / Counselling, with NLP, Life Coaching and Clinical Hypnotherapy to help you build Confidence and Self-esteem. Online confidence and self-esteem building therapy via Skype is also available worldwide. Self-esteem is about our own sense of self worth, it is how we value ourselves and how important we feel we are. Self confidence is about having faith in our abilities. Low levels of self confidence and self-esteem can negatively impact many areas of a persons day to day life. Common situations where people people often feel they need to feel more confidence and self esteem can include public speaking, presentations, meetings, exam nerves, social situations, meeting a partner, job interviews, driving test nerves, stage fright etc. By using an integrative approach and combining psychotherapy / counselling, clinical hypnotherapy, NLP, Self-Relations Psychotherapy and life coaching. We can address the underlying causes, build new behaviours, shift your focus, remove limiting beliefs and build new empowering beliefs about yourself and your abilities, so that your self-esteem and confidence just continue to grow and grow. I recommend booking an Initial Consultation/Assessment session first. This gives us the chance to discuss your requirements further, answer any questions you might have, give you an estimate of the number of sessions you may require and begin the process of change. Many specific confidence and self esteem related issues can often be dealt with in around 8 to 12 one hour sessions of short-term therapy, for more deep rooted, chronic or complex problems, longer term psychotherapy and counselling will be required. I usually see individual clients in a consulting room in my home located on a quiet residential street in Chorlton in South Manchester, close to junction 6 & 7 of the M60 and near the end of the M56. When you are ready to make the inner changes you need to improve your life, just Click here to email or phone me on 0161 881 4333 to discuss ways in which we can work together to help you achieve your outcomes. 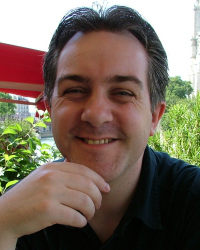 Nigel Magowan has many years of sucessfully helping people with self esteem and confidence building Manchester, he is a skilled Manchester Psychotherapist, Life Coach and NLP Master Practitioner, and Clinical Hypnotherapist.